Farflung - "25000 Feet Per Second"
From Los Angeles, Farflung plays a high energy, often punkish brand of spacerock that is more like a stealth bomber than an acid trip. On this 1995 release the band consists of Michael Esther on guitar, Paul Fox on guitar, keyboards and synths, Tommy Grenas on keyboards, synths and vocals, Brendon LaBelle on drums, Buck McGibbony on bass, and a number of guests on keyboards, percussion, mandolin, flute, and cello. There are actually a number of influences here. I detect punk, early 70's Krautrock, and Pink Floyd sound explorations, sometimes all in the same song. For example, "Solar Electric" opens with two minutes of eerie, call to prayer chanting. Then it launches into another two minutes of space punk. Finally, after a quiet moment it alternates between a very Guru Guru Krautrock sound and more high energy rock 'n punk. Wild! The punk spirit expresses itself in other tunes like the title track, "25000 Feet Per Second", and "Hot Fluffy Mind", which also features some Primus sounding bass and rhythms. "Don't Forget To Breath" illustrates more of what to my ears is a Krautrock influence. There's also a repeating note line in it that brings to mind the 2001 Space Odyssey theme. The nearly 15 minute "Landing In Cydonia" is the disc's epic. For the first eight minutes it's a very Pink Floyd-influenced cosmic sound exploration. It then develops into a Tangerine Dream tinged journey with a heavy dose of electronics. As a finale it launches into a heavy, droning Krautrock sound. 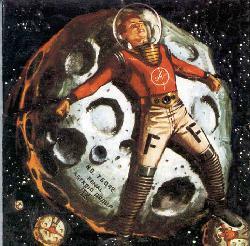 In summary, Farflung will appeal to the heavy cosmic purists who like an overdose of steroids with their spacerock. If this sounds like you then Farflung gets my highest recommendation.